Today we have Taissa Rodrigues discussing her work on the taxonomy of Brazilian pterosaurs. First of all, I’d like to thank Dave for his invitation. I have been studying a group of mostly Brazilian pterosaurs, the Anhangueridae (Dave’s comment: part of the ornithocheiroids as recently pictured here with more on pterosaurian taxonomy here), for almost three years now – together with my advisor, Alex Kellner, who in turn described the anhanguerids for the first time together with his advisor. Unfortunately, my thesis topic can be kind of boring for anyone who’s not THAT interested in anhanguerid taxonomy, so on this post I will do my best to tell something a little less restricted. Overall, Brazilian toothed pterosaurs all looked pretty similar to each other. They had long snouts with sharp teeth, and most probably fed on fishes. They lived on the Araripe Plateau, which 120 million years ago had a very large lake, with an increasingly larger connection to the ocean as time passed by. The Araripe pterosaurs, especially those from the Romualdo Member (or, depending on the author, the Santana Formation), show a remarkable preservation. This enabled some researchers to make inferences on their flight, terrestrial walking, etc. It is then at least curious to think that we know so little about their taxonomy and systematics – in other words, what is an anhanguerid? How are anhanguerid species related to one another? And what about the other toothed pterosaurs from the same deposit? The Anhangueridae has been largely diagnosed on the base of an anterior expansion of the skull and mandible, which beared the large grasping teeth, and also by the presence of a sagittal crest on the anterior portion of the skull and mandible. Other toothed pterosaurs from the same deposit show the large teeth and the corresponding expansion, but did not have crests. More: there is a group of mostly English pterosaurs, the ornithocheirids, which have been pointed out as similar to the anhanguerids. Some of them show anterior expansions and crests; some only the expansions; some only the crests; and some neither! So the big question here is: do all those species really relate to one another, and if yes, how? There is much speculation on the function of those crests, and they influence directly the taxonomy of the group. If the crests grew during ontogeny, then crestless animals should be juveniles of crested specimens. However, there are some specimens that do not corroborate this hypothesis: we know of juveniles that already have crests. If only the males have crests, then the crestless specimens would be females. However, it seems that among living horned mammals, even the females show them, yet smaller. Still, I know only two specimens of Anhanguera that have both the skull and hip preserved. That’s unfortunately not enough to make assumptions on gender, and perhaps future discoveries will help on this subject. The option we adopt is that the presence of crests is a diagnostic feature, i.e., it is taxonomically informative and can be used to differentiate groups of pterosaurs. Now that you have an overview of the problem, I can describe a little bit of the subject of my paper: a review of the genus Coloborhynchus. It was first described in 1874 by the famous British paleontologist Richard Owen (he’s the one who coined the term Dinosauria, by the way) upon a very fragmentary piece of the rostrum from England. Also, it was once considered a synonym of another genus, Ornithocheirus (another rather problematic taxon), but it was reviewed in 1994 and now there is a consensus that they are distinct from each other (probably the only consensus regarding Coloborhynchus). Since this revision, a taxonomic debate has started, with several species from the Brazilian genus Anhanguera being referred to the genus. This subject extends beyond the taxonomic issue itself, having also biogeographic implications. Each person who has studied the genus has described new features that enabled us to compare them with other specimens, including undescribed material, and review the genus. It is interesting to note how science works here: the evidence (the fossils) is the same, yet different views have arisen. In our case, we went after what we believe is a conservative view, requiring fewer assumptions. In such a relatively small fragment, which is the case of the holotype of Coloborhynchus clavirostris, it is possible to observe so many differences from the other species referred to Coloborhynchus that we have placed it as a separate genus. An American species, originally described in Coloborhynchus, was relocated to a new genus. We also made an effort in proposing diagnoses based only in unambiguous characters. Our current view differs from previous ones mostly on the interpretation: what others have seen as evidence of a close relationship, we believe can be primary apomorphies for more inclusive groups, or even convergences, as several features appear in different species of the Anhangueridae and Ornithocheiridae. As to the Brazilian and British species… well, there’s still a lot of research going on to try to clarify their phylogenetic affinities. We have run some very preliminary analyses and so far the results are rather ambiguous. The Anhangueridae and the Ornithocheiridae seem to be a monophyletic group, but… well, enough to say by now that there is still much work to do. Zach, I believe she is using Ornithocheiridae in the same sense as Alexander Kellner. As in referring to the species compressirostris, sagittirostris, giganteus, etc. Most other researchers, seem to follow David Unwin’s taxonomy where these species are members of the genus Lonchodectes (Hooley, 1914) and Anhangueridae is a jr. synonym of Ornithocheiridae. In Kellner’s view the species that Unwin’s camp call Ornithocheirus, belong to the genus Tropeognathus for the Brazilian species mesembrinus and Criorhynchus for the English species simus or just Criorhynchus for both. In this scenario Tropeognathus/Criorhynchus are Anhanguerids. From what I understand from the meeting’s abstract version of this paper, all species heretofore called Coloborhynchus except the type C. clavirostris and the American C. wadleighi (which I gather is the American species that gets relocated to a new genus) are sunk into Anhanguera. Really its a very confusing mess and regardless of my own opinions, Im greatly looking forward to the unambiguous characters and newly proposed diagnoses. I think this is the paper I want to get my hands on the most! Oh yeah dont get me wrong, Ornithocheirid taxonomy is a nasty mess and I definitely dont agree with Unwin whole heartedly. In his attempt to simplify the situation I think he has missed a lot of the group’s diversity. Really about the only thing I do completely agree with is that O. simus is the type of Ornithocheirus. Regarding a type species for Lonchodectes, would L. compressirostris not be considered the type of that genus for the exact same reasons that O. simus is for Ornithocheirus? A monophyletic Ornithocheiridae that includes Lonchodectes would be interesting. Indeed the problem is a realy problem 🙂 I hope to respond in more detail in due course, but I would like to put forward one thing now. My research on these pterosaurs, showed an interesting difference between the teeth of Anhanguera, Coloborhynchus and Criorhynchus (or Tropeognathus, depending if you accept Fastnacht’s conclusions), which is, seemingly, largely ignored. Not only does Anhanguera have more teeth, they are smaller and the graph (alveolar diameter – size) shows a much more erratic pattern. 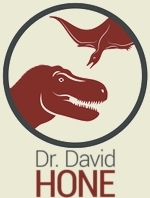 Also the difference between diastemae size within the taxa is substantially different. The specimens I have studied all fit the pattern. If we accept this as a specific for the taxa, several specimens classified by Kellner as Anhanguera fits the pattern seen with Coloborhynchus (note: the BMNH holotype is included in this graph). Thanks for the commentary Andre. I know this is probably the worst bit of pterosaur taxonomy for all kinds of reasons and I think a comprehensive and overarching take is really needed (though I understand someone is at work on this right now). Of course any extra evidence is going to help, I realised only today myself that noone seems to have taken accont of how many vertebrae make up the notarium which probably would provide at least one more useful phylogenetic character (though it is possibly size linked). true, but so many specimens consists either of only cranial material or are not fully ossified. I found that the sternum have some value in this too, but too few are preserved to be very useful. There is another thing I never understand in the whole discussion about Anhanguera/Coloborhynchus/Brasileodactylus/Criorhynhcus-problem: the morphology of the anterior of the skulls is so distinctly different but never noticed or appreciated as such. Indeed, a comprehensive and overacching take is needed: it is of no use whatsoever to publish preliminary evaluations with references to forthcoming exhaustive studies: this will only complicate the whole buseness. I agree that the notarium and sternum are available in too few specimens to be of much value, but that does not mean that differences cannot be recorded and evaluated for future use and comparisons. Yes there are significant differences in the anterior skull of these taxa, but then we do not yet have a clear idea of the ontogenetic sequences and growth of these crests. Many clearly develop late during ontogeny (as seen in Tupuxuara / Thalassodormeus for example) and is probably true of the ornithocherids (the weak crest of the Kellner & Tomida specimen is I suspect strongly linked to its relatively young age) so when we only have anterior jaws or partial skulls to go on it gets very complex (not that there are not other characters in the skulls that are not ontogenetically realted, but the crests have dominated in the past). Finally there is a place for small studies if they can help highlight specific differences that others can use, but in general I agree that a grand approach is needed to cover as many speciemns and features as possible. It’s a huge job and will tkae time and money which is one of the things that has hindered it. You’d need good access to material of dozens of specimens in the UK, Germany, the Netherlands, Brazil, Japan and probably a couple of others too and that won’t be cheap or fast.